It’s time to start planning your big day, yes, your wedding day, and there are so many different colors to choose from. If you’re set on having your wedding in Hawaii or planning on a Hawaiian themed wedding, then our Elegant Hawaiian Hibiscus Flower Wedding Collection is just what you’re looking for to make your day special. 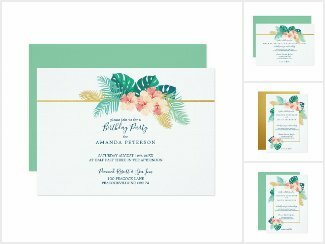 Soft, tropical colors for the palm leaves and flowers and a hint of gold to make it more luxury. See how the design is timeless for each of our customizable wedding invitations. Each item, especially typography, is customizable to add in your wedding details easily. We’ve created several wedding invitation styles along with bridal party invitations, RSVP cards, table seating cards, Save the Date photo cards, a guestbook, program fans and much more. Need the design altered on a product on not found on a product you need, just contact us and we can make it available to you. (c) 2016-2017 Sparkle & Glitter, All Rights Reserved.